April Kraw Lecture with Dan Costa and Caroline Casey "From the Beach to the Sea with Marine Mammals"
"From the Beach to the Sea: How Technology Enables Us to Understand Marine Mammals," gives us an inside look at marine mammal research, including studies based Año Nuevo reserve. 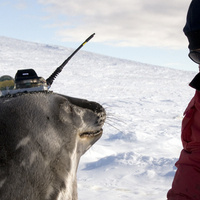 Daniel Costa, a pioneer in the development and use of electronic tags, will discuss how advances in technology that allow precise tracking of marine mammals’ movement leads to better understanding of their behavior and their response to climate impacts on habitats. Caroline Casey, who received her Ph.D in December, studies the evolution of communication between male northern elephant seals. Vocalizations, which are used to drive off would-be rivals, have changed over generations from geographic dialects to individualized and more complex calls.